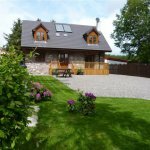 Broombank Cottage nestles in the lovely community of Newlands, next to the historic and moody Culloden Moor and just 7 miles from the city of Inverness in the Scottish Highlands. Although newly constructed in 2010, externally its design is traditional and its hand pointed stone is most handsome. The cottage is bright, spacious and has all conveniences needed for modern living. 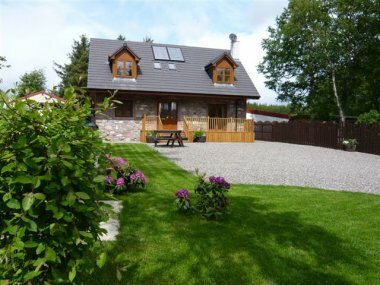 The Highlands are for the young and old alike with activities to suit all and after a day out you will look forward to returning to this lovely cottage where you can relax in front of the log burner. When summer comes, you will take advantage of the decking where you can watch the world go by and enjoy the views from the front garden or a summer evening barbeque, what could be nicer? Broombank Cottage is situated on our 11 acre croft which currently has a small flock of 16 Herdwick ewes and a Tup\Ram affectionately known as "Finkle". Lambs are born during April and early May and can be seen from the cottage playing in the fields. The croft is also home to free range hens and ducks - their eggs are much appreciated by our visitors. Brinn and Jan, our 2 border collies, are always keen to help when required.